I’ve camped at Fundy National Park in southeastern New Brunswick nearly every summer for the past twenty-nine years. Fundy is like a hidden retreat, pulling me away from my life in Halifax to laze on the sea floor and hike deep into the woods. Here, warm days are meant for paddling across the lake, scouring the salt marsh for shorebirds, and swimming in pools along the river. I feel at home in the park, despite growing up in Nova Scotia. Which is why I took notice when, in 2012, Parks Canada was forced to cut costs, which meant reducing access to the winter camping season in several national parks—including Fundy. At first, I didn’t think I’d be affected; I’d never considered returning to Fundy in the winter. 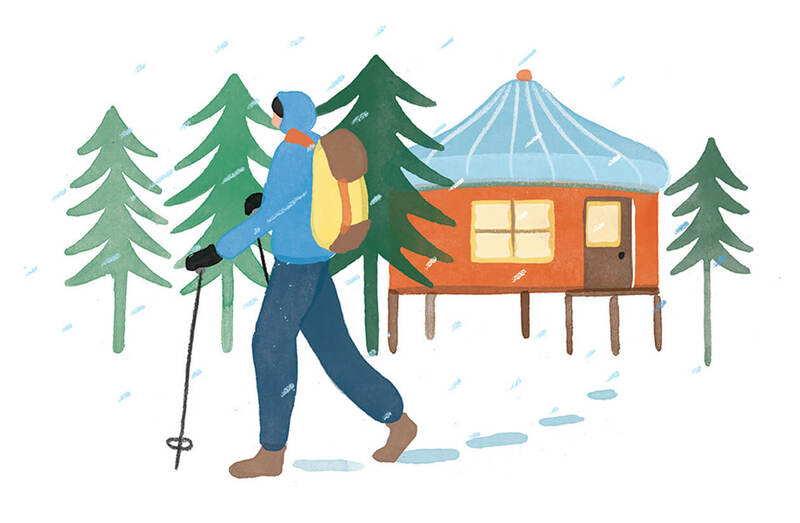 Spending my days—and nights—outside in the freezing wilderness did not appeal to me. I didn’t think it would appeal to a lot of people. But I was wrong. Following the announcement, supporters of Kejimkujik National Park in Nova Scotia launched an online petition to protest the changes: national parks, they argued, should be accessible—and cared for—year-round. Volunteers were trained to use snowmobiles to clear ski trails. In Quebec, the province and local municipality paid for workers to operate snow-removal equipment in Forillon National Park. One local business owner near Riding Mountain National Park in Manitoba used his own money to winterize shelters. And then, in time for the Canada 150 celebrations, Parks Canada announced that Fundy would be among those parks reopening their facilities in the winter of 2017. Curious, I decided to try winter camping for myself. I arrived one February evening to find the park I had known all my life—a park famous for its mossy valleys and rocky shorelines—glistening white. Before me, near the entrance, a pair of snowbanks stood like frozen giants in the dark. A chimney poked above the trees, its narrow stack hissing with sparks. Raising my lantern, I followed the smoke until I reached a cookhouse, icicles dangling from its wooden gables. Several of the nearby campsites on a hill overlooking the beach were occupied—including by a family in a motorhome, with a hammock stretched between two large spruce trees. I continued past them down the gravel road to my site, the first in a small loop where I used to pitch my tent as a kid. There was no way I was going to dig flimsy poles into the snow, let alone try to secure them in the wind. Instead, I’d booked a yurt for my stay, and I walked into the hut to find latticed walls covered in thick felt, a propane stove, and, to my relief, a bed. I hurried toward the stove and warmed my hands before leaning my head back to get a look at the skylight in the ceiling above. It was a clear night with no moon, and I could see plenty of stars. I grabbed a thick blanket, draped it over my coat, and pushed open the door. Outside, two chairs looked on to the beach below, where the ocean pitched and rolled, carrying away driftwood scattered along the sand. I settled into one of them, watching a handful of lights glowing in the houses of the fishing village below. Closing my eyes, I listened to the waves pounding against the shore, while somewhere in the forest, some animals—probably coyotes—yelped in the distance. There was a stillness to the park in February that I had never experienced before. On a summer night, Fundy would be buzzing with campers, but winter had stripped it bare. The feeling carried into the next day, when I hiked across a frozen bog without encountering a single other visitor. Things I’d seen countless times were transformed: a waterfall turned into cascades of ice, the hill where I used to picnic became a slope for sledding, and well-worn footpaths were now endless stretches of snow-covered woods. The next morning, I got up early to watch the sunrise, a long sweep of red light on the horizon. I thought I knew Fundy as well as anyone could, but in this moment, I realized I’d been missing a crucial piece of the park I loved. Staring at the beach dusted in snow, I was reminded of the opening line to John Burroughs’s 1910 essay “The Snow-Walkers,” about the Catskill Mountains: “He who marvels at the beauty of the world in summer will find equal cause for wonder and admiration in winter.” After almost thirty summers, I could see he was right.